The Haitian Government does not provide free schooling for Haitians. The two greatest challenges facing Haitians is lack of education and malnutrition. Our school program addresses both of these challenges. When a family cannot afford food, they will not make education a priority for their children. When our feeding and school assistance program is implemented in the school, the parent will pay for school. The daily meal is the biggest cost to a family in Haiti. Taking that burden off the family means a child will go to school, remain in school and be fed daily. Without Hearts for the Hungry many children would not receive an education and many would starve. 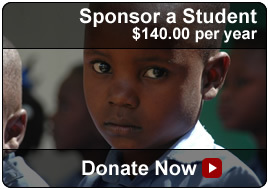 We are a non-profit organization providing food for hungry children in schools throughout Haiti. Our goal is to provide hope for the future of those we serve. We offer a school feeding program consisting of one nutritious meal a day through out the year which is usually the only meal the child will have that day. When funds are available, we also support schools with the materials needed to encourage education and support the teachers with the tools they need such as paper, chalkboards, chairs, books, and other necessary materials. At times, we also assist in materials needed to improve the school building. Hearts for the Hungry is directed and operated by team members in the US and Haiti. 100% of your money goes to food and the cost to transport the food. None goes to administration costs. These costs are paid by separate donations. When you donate to Hearts for the hungry none of your money will go to mailing costs or anything but what you choose the funds for. E-mail / info@heartsforthehungry.org © 2019, Hearts for the Hungry.